There wasn't a whole lot of co-op news coming out of the Nintendo Direct on Wednesday. The previously announced Kirby title finally got a name, Kirby Star Allies, and a few already known co-op titles, like Nine Parchments, were shown off, but other than that, the only other semi co-op news was the announcement of a Super Mario Odyssey Switch bundle that will be available to purchase soon. 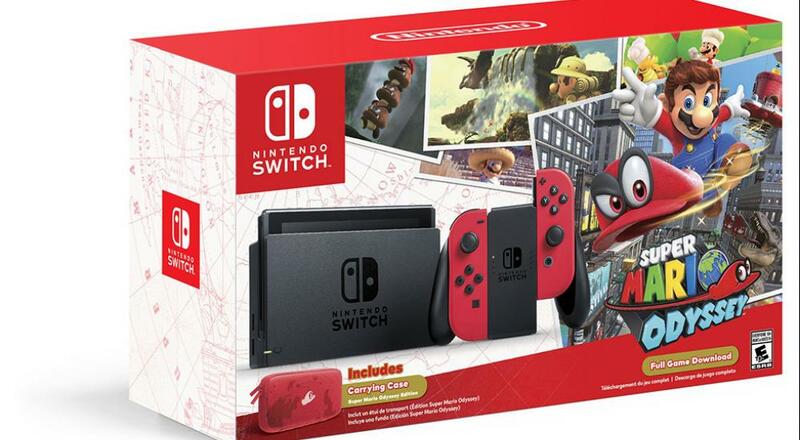 The bundle will retail for $379.99 and will include everything you normally get with a Nintendo Switch (i.e., the console, the dock, an HDMI cable, an A/C adapter, a Joy-Con Grip, and Joy-Con Wrist Straps), two red Joy-Cons, a download code for the game, and a special Super Mario Odyssey themed carrying case. It's not a bad deal, overall, and the carrying case makes it easier to take the Switch with you to a friend's house so you can enjoy a little Mario co-op. That feature - couch co-op anywhere - is really the big selling point of the Switch, for me, and with the recent announcement of all the indie co-op titles that are headed to the Switch soon, this bundle is a pretty good way to not only get the console but a co-op game to boot!